As a Farm Bureau member, you know who you are and what Farm Bureau represents. But for a large portion of Ohioans, that isn’t always the case. That’s why OFBF is giving members the opportunity to stand up and speak out for themselves through the new “I am Farm Bureau” campaign. Cassidy bills “I am Farm Bureau” as a way for members to stand up, speak out, correct misinformation and tell the stories of who they are and to let those outside of agriculture see who Farm Bureau is. The campaign started in February when members attending OFBF’s Ag Day at the Capitol started wearing “I am Farm Bureau” pins when visiting their state lawmakers. Many of the county presidents were also wearing the pins when visiting with national lawmakers in Washington, D.C. earlier this month. The campaign will be introduced to many this month during county Farmers’ Share Breakfasts, where a video presentation will highlight the wide-ranging characteristics of Ohio Farm Bureau members. Materials from placements to hats and aprons will feature Farm Bureau members with the “I am Farm Bureau” message. But that is just the beginning of the campaign. Cassidy said it is designed to fit nicely into local activities happening throughout the spring and summer such as county fairs and local farm tours. “I am Farm Bureau” will also be the theme of many 2010 events, including OFBF’s Leadership Conference and annual meeting. Customizable advertising and marketing materials, including T-shirts, are available for local use. Contact your county Farm Bureau office for details. Another way members can help consumers understand the diversity and grassroots nature within Farm Bureau through the campaign is to invite local media to attend a variety of meetings to see how Farm Bureau works at the local level. The culmination of the campaign is expected to occur in late summer with a media campaign featuring a diverse group of OFBF members telling why they are Farm Bureau. “I am Farm Bureau” will also have an active online and social media component, where Farm Bureau members are encouraged to keep their eyes open for opportunities to actively participate in the campaign in the near future. Be sure to become a fan of OFBF on Facebook (www.facebook.com/OhioFarmBureau) to be notified of opportunities. 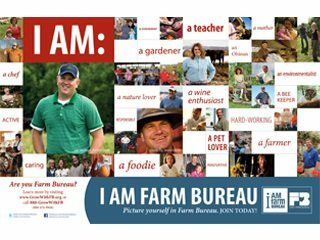 *UPDATE* – Ohio Farm Bureau members can now participate in the I am Farm Bureau contest. Entries are being accepted through May 31, 2010. For complete details and to get started, visit http://tinyurl.com/IamFarmBureau.